Building up to the groundbreaking DB Sports Tours Champions Cup at Oriel Park on January 5th, each week we will profile one of the five talented schoolboy sides that will take on Northern Ireland’s best for the title of the top team on the island in their respective age group. TEMPLEOGUE UNITED U15s – Templeogue United manager Alan Kinsella insists putting on a show is the priority when his SFAI national champions step into the unknown. The former Bohemians defender will bring his side to Dundalk next month to face Northern Ireland champions Crusaders in the DB Sports Tours Champions Cup. The expanded tournament – which began as a two-legged U-15 clash between Shelbourne and St Oliver Plunketts last year – pits the five SFAI national champions against their Northern Ireland Boys Football Association counterparts in an exciting day of action. There will be a mouthwatering selection of DDSL sides on show, with Malahide United, Cherry Orchard, St Francis and Crumlin United all hoping to upstage Templeogue and each other on the ultimate day of showcase action. 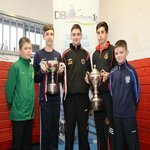 Kinsella’s Templeogue are possibly the most well-known schoolboy side in Ireland at present, with their slick style of football earning them a second national crown in just two years last season. Last year’s SFAI and Premier division U-14 double followed up the side’s 2010 double at Under-11 level, with an U-12 runners-up finish in the top-flight splitting the two achievements. Templeogue’s success at this age group stems from the development of the group of players all the way from Under-8s playing an expansive brand of entertaining football under Kinsella. Unlike other clubs, who constantly lose their players to the traditional big boys on both sides of the capital following small-sided success, Templeogue’s reputation has gone before them and they have attracted players from outside along their journey. Their manager’s insistence that they above all else showcase their talents next month provides a glimpse into what motivates this talented group of youngsters. “This is a great opportunity for all the teams across the age groups to showcase their talents on what should be a great day,” insists Kinsella. “I don’t know if it really decide’s the best team on the island, because it is simply a game on the day, but it is a great opportunity to play a good side you wouldn’t normally get the chance to play. “The fact that so many really top teams are going to be on show on the day make it very exciting I would think. “We will be certainly looking to put on a show because we have always taken pride in combining a brand of football played the right way with winning. “We didn’t start out to combine the two but it has happened that way and to it with a group of players that have come all the way through is fantastic.